"This is the cathedral of Paris, Notre Dame du Paris, our Lady of Paris, dedicated to the Virgin Mary...it ain't bad, is it?" The History Channel has carved out a niche for itself over the past decade by producing high-quality, informative but accessible specials and series. Engineering an Empire is one of the most recent, and one of the best. In its genre, shows sometimes have the tendency to veer too much toward entertainment and over-dramatization, but this one maintains a skillful balance. Nor is it to be confused with Lost Worlds, another History series. That one spends time digitally recreating ancient structures in order to suggest what they would have looked like during their peaks of usage. There's some of that here, but the emphasis in these twelve episodes is more on architecture and construction techniques, as well as the personalities behind them. It's not as wonky as it may sound, which could be as much a plus as a minus depending on your appreciation for detail and interest in engineering. The first episode, Greece (one of two episodes dealing with ancient Greek construction), introduces the corbelled-style arch as used in Agamemnon's tomb. A new concept to me, but even I could follow the deconstruction using matchbooks and digital animation. That very accessibility might turn off more technical-minded viewers, but it's clear from the beginning of each show that the building techniques are primarily a way to introduce larger historical topics. That tomb in the Greece episode is the cap to a discussion of Agamemnon's legendary place in history. Even if you know exactly what a flying buttress is and where to find one, there's still a good bit of meat in the background of Bishop Maurice de Sully, who built the enormous Notre Dame de Paris cathedral based a sketch he made of his vision in the dirt. While not dealing strictly with buildings, the show appropriately takes the tack that the architecture of the great buildings of the world is inseparable from the history of those places. The engineering marvels of the Palace of Versailles (ever wondered how all those impressive fountains got water?) are of a piece with the ambitions of Louis XIV and his heirs, which would eventually lead to the French Revolution. The palace itself was first the symbol of the Bourbon kings and a means of solidifying power; later that very grandiosity became an albatross around the necks of the French ruling class and a rallying point for the oppressed revolutionaries. Indeed, one wonders how French history might have evolved without Versailles, and it's certainly reasonable to suspect that things would have gone quite differently. It's much the same with the Great Wall, the Parthenon, the Kremlin, the observatory at Chich�n Itz�. The Persians expanded their enormous empire through a system of roads undreamed of in the world to that point. The skills of Alexander the Great's engineers in designing siege engines, pontoon bridges, and projectile weapons brought Macedonian-Greek culture to the world and ended the influence of those same pluralistic and powerful Persians. The buildings of Novgorod are a reminder that that city, not Moscow, was once the center of Russian culture. No civilization in history has ever been worthy of the title "empire" that hasn't also backed up its power with impressive feats of engineering. Although the great pyramids aren't discussed here (an episode on "Egypt" is available separately), they best exemplify the idea. They're the first thing that one thinks of when considering ancient Egypt, and we remain in awe of the empire that built them even thousands of years after it disappeared in the sand. So, the profound influence of design and engineering on history is the point in this series, and Peter Weller is, perhaps surprisingly, an effective guide to the highlights. More than merely a narrator (Michael Carroll serves ably in that role), Weller is on location in each episode and each segment, often interviewing experts in person. As an occasional Syracuse University lecturer, Weller has a great voice, but it's not the only reason he's here. He has a thoughtful and inquisitive mind, and as the behind-the-scenes featurette indicates, much of the information that he relays comes less from a script than out of ad hoc conversation with knowledgeable guests. There's certainly nothing wrong with hiring a deep-throated celebrity to read your copy, but it's nice to see this one get his hands dirty. He's as crucial to this show as is a Josh Bernstein on Digging for the Truth, another History Channel hit. Empire also shares with that show the high production values that have helped to make History Channel programming popular with a broad audience. The location footage is fresh and pretty, and the digital work is done well and sparingly. While architecture or engineering buffs may be looking for a bit more meat in those areas, this is a great series for even mild history buffs. Image Transfer Review: For the most part, the transfer is quite lovely. It's very crisp, and colors are rich and vibrant. I noticed a few instances of ghosting, but rarely. Nitpicks aside, the show looks great on DVD. Audio Transfer Review: The Dolby 2.0 track is full and lively. The music is well-balanced, and the narration is clear and strong. Extras Review: The fourth and final disc includes a Behind-the-Scenes featurette. It's really just a collection of unused location footage with host Peter Weller, but there is added insight into the various spots that were visited in the show. More enjoyably, Peter Weller really digs into some of the topics to be discussed with experts. He's likeable and engaging in these chats, even when just getting set up for the regular filming. It's just under 20 minutes long, but if you enjoyed the series proper, you'll enjoy this extra. It may seem an obvious point, but the great engineering marvels of influential civilizations are inseparable from the personalities that helped make them great empires. 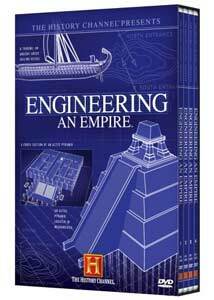 Engineering an Empire serves as a brisk but enlightening and entertaining introduction to some of the most important architectural and engineering feats, and the leaders behind them, from Pericles' Parthenon to Eiffel's Tower, with dozens of stops in between. Though known mostly for his movie work, Peter Weller provides thoughtful guidance. Hard-core engineering buffs may be a bit disappointed by the intro-level explanations, but there's a great deal here for lovers of history to enjoy.